In a previous post we tried to explain what crossover guitars are and we covered a general approach of the concept and purpose of those guitars. In this post we are going to present you a review from Guitarist magazine of the Alhambra CS3CW E5 Electro-acoustic Crossover nylon stringed guitar, a high quality spanish guitar that covers the gap between the acoustic guitar and the classical guitar. An instrument that once you try it, its difficult to forget. Alhambra guitars is a Spanish maker located in Muro de Alcoy, in the province of Alicante, that has been successfully making nylon string guitars for over 40 years. Along with its standard classical instruments, Alhambra is known for its electros like the Alhambra 5P CT.
And while some feature a slightly thinner-than-classical-standard neck width, to most electric players, and many steel-string players, the classical neck still feels massive and invariably has a flat fingerboard. The Crossover, however, is a full-depth cutaway released in 2007 that aims to bridge the gap between steel and nylon: a purpose-designed electro for those used to steel-strings. Visually it displays a strong steel-string vibe thanks to its natural finished spruce top which contrasts the dark chocolate-coloured rosewood back and sides. The white face is contrasted again by an ebony bridge with its maple ‘V’ inserts, which mirror the V-shaped, ‘A’ logo’d maple insert in the rosewood headstock facing – the inlaid rosette is suitably dark and gothic too. Construction is very clean, the maple edge bindings and inner purflings are sharp. The head and main shaft of the mahogany neck is one piece – with a central ebony strip for reinforcement, there’s no truss rod – while the heel is a separate piece and has quite a complex carve as it joins the cutaway body. Internally you can see a fairly classic Spanish-style foot, kerfed mahogany linings top and bottom, mahogany back braces and spruce top strutting (and hidden standard seven fan braces). It all looks very clean and considered. The fretwire is cleanly installed on the radiused ebony fingerboard. Another break from tradition, though hardly radical, are the side-only dots at the third, fifth, seventh and ninth frets and the neck joins at the 12th so position orientation should be easy enough. While the scale is fairly standard at 650mm things are slightly narrower than usual, in Spanish terms, at the nut which is just over 48mm wide (as opposed to 50-52mm or more) and a gnat’s under 60mm at the 12th. Yet at 20.4mm at the first fret, and 25mm at the 10th, you’ll not feel the neck is over large. The shape is quite flat-backed with square shoulders and we have to say the neck is very comfortable and easy – especially compared to a quality concert classical. 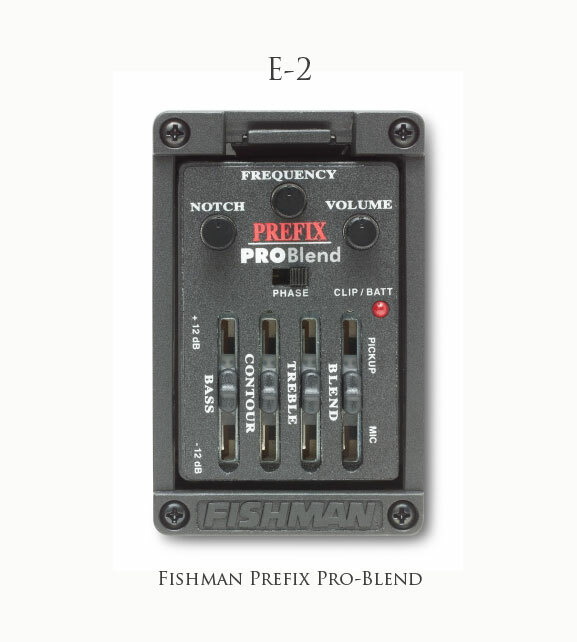 You can order the Crossover with various Fishman preamps to manipulate the undersaddle piezo. 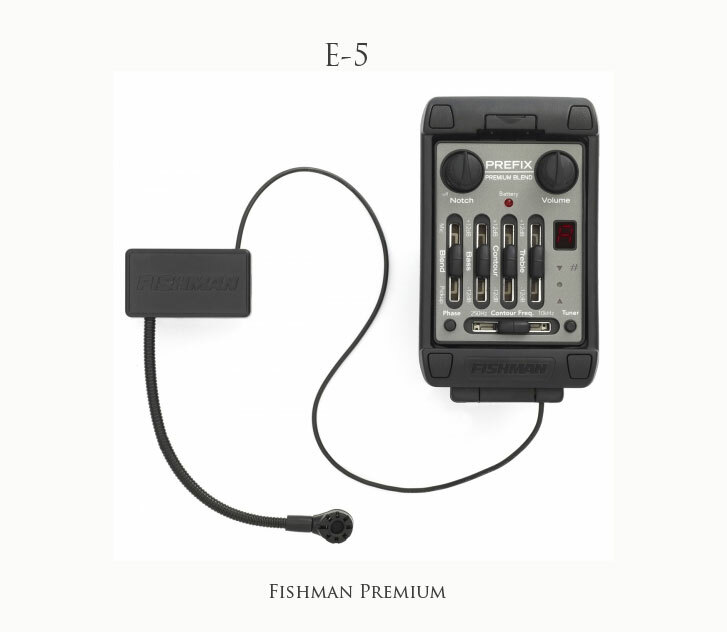 The E5 system here is one of the Fishman‘s top-end Prefix Premium Blend and includes both under-saddle piezo pickup and a separate gooseneck mic that is installed on the bass side shoulder. The two pickups meet up on the pretty complex control panel that flips out for swift battery changes and also access to a mono/stereo switch. The preamp’s controls are well laid out but with white legends on a light grey fascia the contrast is low and in low lighting, compounded by the sheen of the facia, it’s very difficult to read. But the spec is high with slider controls for mic/piezo balance, frequency (10khz-250k), and treble, contour and bass with a range of +/- 17db (all centre notched). While the treble and bass frequencies are fixed, the contour affects whatever frequency you’ve set with the frequency slider. A pair of push buttons engage the phase switch for feedback rejection and the onboard tuner that is easier to see and very accurate. Finally, two rotary controls affect overall volume – very nicely placed at the top corner and with a very tactile rubber knob – and the notch filter which ranges from off to 300Hz and removes a very narrow band for feedback rejection. A red LED battery indicator completes the fulsome spec. Strung with Alhambra-branded D’Addario extra high tension strings, the supplied set-up is also lower than a standard classical (3.5mm bass, 2.2mm treble). But although the saddle noticeably leans back in its slot, there’s no actual compensation, especially for the thick G (unwound) string that proves a little sharp. That aside, the combination of the neck shape, fingerboard radius and cutaway make the Crossover a fluid player. The tuners seem a little spongy, but once new strings settle in, tuning is stable. Factor in this guitar’s cutaway and there’s an impressive robustness and depth to the acoustic tone. Yes, it sounds a little tight, yet the dynamic range is acceptable. Yet it’s the amplified sound that we’re primarily interested in and that’s where, along with fairly effortless playability, the Crossover scores. Amplified nylons can be surprisingly bright and brittle and there’s some of that here, but with careful EQ’ing it avoids sounding too thin and plastic-y: in fact there’s a richness and plumbiness to the tone that keeps us playing this one. The mic adds a diffused, less direct sound, but keeping it under control especially in a live environment, isn’t easy. That said, with nylon strings the onboard tuner is a Godsend – particularly as it can be used unplugged. Bearing in mind the base price of this guitar, it’s very well made, sharp and clean. The cutaway might well limit it’s acoustic volume but it’s enough for small room ensemble use. Amplified it performs to a high standard and the easy playability makes it hard to return to a larger-necked traditional classical. The E5 electronics package adds considerably to the price but even with the E2 system you’d be purchasing a lot of guitar. But the dual-pickup Fishman system fitted here – despite the excellent onboard tuner – might be too much for more general use. By design the Crossover should appeal to anyone working in a jazz, Latin or pop field that wants to add some nylon magic – one we’d recommend you try. This review covers the spruce top version of the Alhambra CS3CW but there is also a cedar top version of the guitar that you can order for the same price at www.guitarfromspain.com. The electro version of this guitar comes with the Fishman Matrix Pro-Blend (E2) as the standard option but you can also order it with the mentioned Fishman Premium Blend (E5). The Matrix Pro-Blend (E2) also combines a piezo pickup and microphone at a more affordable price with brilliant results. Ar you sure there is nothing missing in your guitar collection? Posted in Acoustic Guitars, Classical guitars, electro classical guitars, electroacoustic guitars, flamenco electric guitars, Flamenco guitars, flamenco instruments, guitar, guitar techniques, guitar tips, musical instruments and tagged Acoustic guitar, alhambra, alhambra 10p, alhambra 11p, alhambra 4p, alhambra 5p, alhambra 6p, alhambra 7c, alhambra 7pa, alhambra 8p, alhambra a luthier, alhambra acoustic guitar prices, alhambra acoustic guitar review, alhambra crossover, alhambra crossover cs3cw, alhambra crossover review, alhambra crossover series, alhambra cs1cw, alhambra cs3cw, alhambra cs3cw review, alhambra cs3cwe2, alhambra cs3cwe2 review, alhambra electro, alhambra guitars, alhambra guitars australia, alhambra guitars for sale, alhambra guitars france, alhambra guitars germany, alhambra guitars uk, alhambra guitars usa, best classical guitar, best flamenco guitar, buy flamenco guitar, buy spanish guitar, classical guitar, crossover guitar, crossover guitars, flamenco guitar, flamenco guitar price, Guitar, guitar alhambra, how to buy spanish guitar, sellers for Alhambra, spanish guitar, Spanish guitar making. Bookmark the permalink. Wow, I must say that what a guitar finishing and the curves are just awesome, I become a fan of that “Alhambra Crossover CS3CW ” guitar. I love the curves ! Look beautiful! I’m sure its sound would be fantastic. It does sound fantastic, both amplified and unplugged. We love this guitar.